Focused Moments is on hiatus while I am travelling Down Under. In the meantime, I wish everyone a very merry Christmas and a happy New Year. 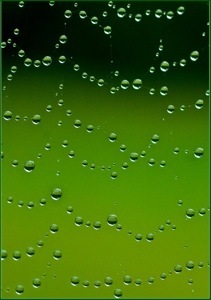 This entry was posted in Christmas, nature, photography and tagged baubles, droplets, green, macro, nature, photography, spider's web, water drops, web by Rachael. Bookmark the permalink. Merry Christmas and have a blessed 2014! Happy Christmas to you Rachael and enjoy your trip. Same to you, and don’t fall off while down there . . . hug someone really tight! Have a great time in Australia, hope you get some Macro photographs while you are over. All the best and hope you’re enjoying my vast, brown insect-loaded homeland — looking forward to getting back there myself in just a week now :).